For the locality in Queensland, see Wangaratta, Queensland. 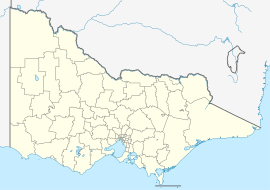 Wangaratta (/wæŋɡəˈrætə/) (known as the Rural City of Wangaratta) is a cathedral city in the northeast of Victoria, Australia, approximately 250 km (160 mi) from Melbourne along the Hume Highway. The city had an estimated urban population of 28,824 at April 2018. Wangaratta has recorded a population growth rate of almost 1% annually since 2016 to 2018 which is the second highest of all cities in North-Eastern Victoria. Aerial view from the north-west, Hume Freeway bypass somewhere around top, One and Three Mile creeks meeting around the middle. The city is located at the junction of the Ovens and King rivers, which drain the northwestern slopes of the Victorian Alps. Wangaratta is the administrative centre and the most populous city in the Rural City of Wangaratta local government area. The original inhabitants of the area were the Pangerang peoples (Pallanganmiddang, WayWurru, Waveroo). The first European explorers to pass through the Wangaratta area were Hume and Hovell (1824) who named the Oxley Plains immediately south of Wangaratta. Major Thomas Mitchell during his 1836 expedition made a favourable report of its potential as grazing pasture. The first squatter to arrive was Thomas Rattray in 1838 who built a hut (on the site of the Sydney Hotel) founding a settlement known as "Ovens Crossing". The Post Office in the area opened on 1 February 1843 as Ovens. The Ovens office, and the Kilmore office which opened the same day, were the fifth and sixth to open in the Port Phillip District and the first two inland offices. The name Wangaratta was given by colonial surveyor Thomas Wedge in 1848 after the "Wangaratta" cattle station, the name of which is believed to have been derived from an indigenous language and meaning "nesting place of cormorants" or "meeting of the waters". The first land sales occurred shortly afterward and the population at the time was around 200. The first school was established by William Bindall on Chisholm Street with 17 students. Gold was found nearby at Beechworth in February 1852 and by the end of the year more than 8,000 prospectors rushed the fields of Ovens and Beechworth. Wangaratta became a major service centre to these goldfields. As a result, the first bridge over the Ovens was completed in early 1855. A seven-member council incorporated the Borough of Wangaratta on 19 June 1863. The 1870s saw the settlement establish a number of key infrastructure and services including the first water supply. Wangaratta hospital was opened in 1871 and the fire brigade was established in 1872. The railway to Melbourne was opened on 28 October 1873. On 28 June 1880 in the nearby small town of Glenrowan, located some 10 km away, the final shootout that led to the capture of Australia's most famous bushranger, Ned Kelly occurred. In 1883, the railway was connected through to Sydney. The population at the turn of the century reached 2,500 and the centre had developed an imposing streetscape of hotels, commercial public and religious buildings. Bruck textile mills was established in 1946, employing over a thousand workers. Wangaratta was proclaimed a city on 15 April 1959 with a population of 12,000 people. New municipal offices were opened in 1980 which became the headquarters of the Rural City of Wangaratta after the amalgamation of municipalities in 1995. The geographical layout of the city is unusual in that the business district is located at the north-eastern extremity of the urban area, with outlying suburbs extending only to the south and west. The reason for this arrangement is that the area beyond the rivers, to the north and east of the business district, was until the 1990s prone to flooding and so unsuitable for building. Levees were constructed in the 1990s to alleviate the flooding, however development in this area has been slow. Notable buildings include the Holy Trinity Anglican Cathedral and its Cathedral Close, St. Patrick's Catholic Church and the eccentric art déco courthouse. Since the warmest month mean reaches 22 °C (72 °F), Wangaratta would have a humid subtropical climate (Cfa in the Köppen climate classification). Despite its classification, it is located in a transitional region that also tends to receive dry searing winds from the northwest. April is the driest month; June is the wettest. Despite its location close to the Snowy Mountains and the ski fields, Wangaratta does not get severely cold or snowy in winter and daytime maximum temperatures are rather mild, although cold air drifting down from the mountains can cause frosty mornings during clear winter nights. Rain falls as thunderstorms in the summer, and in winter with cold fronts. Occasional severe heat waves are caused by hot, dry air from the central deserts of Australia moving over the area. Temperatures of 40 °C (104 °F) and slightly above occur 2–4 times a year on average; however, heatwaves are often succeeded by cold fronts, which cause a significant drop in the temperature. The city gets 105.1 days annually, which is akin to Sydney and Wollongong. Rainfall averages out to 630 millimetres (25 in) a year, most of which falls in winter with passing frontal systems; however these can occur at any time of year, and the main form of rainfall in spring and summer is from thunderstorms. Extreme temperatures have ranged from 45.8 °C (114.4 °F) on 3 January 1990 and again on 7 February 2009 to −7.2 °C (19.0 °F) on 14 June 2006. In local government, the Wangaratta region is covered by the Rural City of Wangaratta. The council was created in 1994 as an amalgamation of a number of other municipalities in the region with the council chambers located at the Government Centre in central Wangaratta. The City is represented by seven councillors elected once every four years by postal voting. The mayor is elected from these councillors by their colleagues for a one-year term. In September 2013 the council was sacked by the state government. Victorian Local Government Minister Jeanette Powell said this was because "Council has failed to provide effective leadership and service for the community". The council will be replaced by an administrator who will serve until the 2016 local government elections. In state politics, Wangaratta is located in the Legislative Assembly district of Ovens Valley currently held by the National Party of Australia. In federal politics, Wangaratta is located in a single House of Representatives division—the Division of Indi. The Division of Indi was seen as a safe Liberal Party of Australia seat from 1977 until 2013, when the sitting member, Sophie Mirabella was defeated by independent candidate Cathy McGowan. There is a considerable wine and gourmet food industry in the nearby Milawa and King Valley region. Other notable industries in the area include Australian Textile Mills formerly Bruck Textiles, Wilson Fabrics that now occupies the old IBM facility, Merriwa Industries and Australian Country Spinners. Previously multi-national IBM manufactured computers in Wangaratta. Australian rules football, cricket and Netball are the most popular sports. There are four Australian rules football clubs in Wangaratta. The Wangaratta Football Club, the Wangaratta Rovers Football Club, both competing in the Ovens and Murray Football League, and the North Wangaratta Football Club, which competes in the Ovens and King Football League. The close proximity of the Rovers and Wangaratta grounds reflects the historical sectarian split in membership of the clubs; Rovers membership being predominantly Catholic and Wangaratta being predominantly Protestant. The Centrals Junior Football Club was established in 1938, and are affiliated with the Wangaratta & District Junior Football League. The Australian rules football club focusses on developing young people. Their home ground is the Bill O'callaghan oval on the HP Barr Reserve. The city hosted several games for the 2005 Australian Football International Cup event, with several countries competing in the sport of Australian rules football. The event was played at the City Oval and Showgrounds and set the attendance records for the tournament to date. Cricket in Wangaratta is organised by the Wangaratta and District Cricket Association. Clubs include Wangaratta Magpies, Rovers United Bruck, City Colts Cricket Clubs. There is one soccer team in Wangaratta, the Wangaratta City Football Club. Founded in 1951, they compete in the Albury Wodonga Football Association. Wangaratta has a horse racing club, the Wangaratta Turf Club, which schedules around eleven race meetings a year including the Wangaratta Cup meeting in April. The Wangaratta Greyhound Racing Club, which held regular meetings at the same venue, has been discontinued. Avian Park is no longer used. Golfers play at the course of the Wangaratta Golf Club on Yarrawonga Road, or at the course of the Jubilee Golf Club at Wangandary nearby. A nine-hole course is at Boorhaman to the north of Wangaratta. Between 1953 and 1956, the North Eastern Car Club ran motor racing meetings on the gravel and earth airstrip located on Wangarratta Common, south of the town centre. The circuit ran up and down the airstrip, with a loop at the western end. The main annual event is the Wangaratta Festival of Jazz, which attracts renowned international acts and has been attended by thousands each year since 1990. Ales on the Ovens Craft Beer Festival is another main attraction for the town. The Goulburn Ovens Institute of TAFE has two Wangaratta campuses. The Docker street campus offers a broad range of courses from business studies to music with a central area containing a cafeteria, library and student services. The Christensens Lane campus on the outskirts of Wangaratta is the home for the National Centre for Equine Education as well as providing courses in horticulture. In 2015 the Christensens Lane campus moved to a bigger site in Tone Road. And in 2016 Charles Sturt University also added a campus there. The old Christensens Lane campus was then dismantled to make way for a new housing estate. Roads are the most used transport infrastructure in Wangaratta. The Hume Freeway (M31) bypasses the city to the south and east, while the C314 now forms the main road through it (as Murphy Street and Wangaratta Road). The city is located at the junction of several other major roads, the Great Alpine Road (B500), Wangaratta-Yarrawonga Road (C374), Wangaratta-Whitfield Road (C521) and Wangaratta-Kilfeera Road (C523). A city bus service runs every half an hour during the day on weekdays and on Saturday mornings on a route covering Wangaratta's West End, the business district, Yarrunga and more recently, Yarrawonga Road. Rail transport services both passengers and freight. Wangaratta railway station is on the North East railway line, the main railway line between Sydney and Melbourne. It is served by the Albury V/Line rail service thrice-daily as well as the NSW TrainLink XPT service twice-daily in both directions. Historically, Wangaratta was the busy junction of several railway branch lines including; the broad gauge 5' 3"Yackandandah railway line, a narrow gauge 2' 6" Whitfield railway line and the broad gauge 5' 3" Bright and Beechworth railway line, all of which have since closed. Another short 5' 3" gauge branch line ran west to a wheat silo located on the north side of the Ovens River at Boorhaman. The current rail line through the town is the 4' 8" standard gauge rail opened in 1962. Wangaratta is also serviced by a small regional airport, Wangaratta Airport. Some stations from nearby centres such as Albury-Wodonga and Shepparton can be heard across the region. Larsen, Wal. The Mayday Hills Railway, Wal Larsen, Bright, 1976. O'Callaghan, Bill and Bill Findlay (1984). "Wangaratta, 1959–1984: A Silver City", City of Wangaratta. O'Brien, Antony. Shenanigans on the Ovens Goldfields: the 1859 Election, Artillery Publishing, 2005. Oberg, Leon. Railways of Australia, Reed, Sydney, 1975. Thompson, John E. Focus on Victoria's Narrow Gauge Whitfield Line, Puffing Billy Preservation Society, Belgrave, 2002. "Wangaratta: Capital of North Eastern Victoria", (1927) Committee of the Back to Wangaratta Celebrations. Whittaker, D. M. (1963). "Wangaratta: Being the History of the Township that sprang up at Ovens Crossing and grew into a modern City", Wangaratta City Council. Why Wangaratta, and Moments in Jazz (books on the Wangaratta Festival of Jazz and Blues). ^ "2011 Census Community Profiles: Wangaratta". ABS Census. Australian Bureau of Statistics. Archived from the original on 11 November 2017. Retrieved 15 September 2016. ^ "City on the up » Wangaratta Chronicle". Wangaratta Chronicle. 30 March 2017. Retrieved 20 March 2019. ^ "History of Wangaratta". Archived from the original on 28 January 2014. ^ "Wangaratta Holy Trinity Cathedral". Archived from the original on 31 March 2012. Retrieved 30 August 2011. ^ "WANGARATTA AERO". Climate statistics for Australian locations. Bureau of Meteorology. April 2013. Retrieved 27 April 2013. ^ "State Election 2006 Results: Electorate swings". Victorian Electoral Commission website. Archived from the original on 30 November 2007. Retrieved 16 December 2007. ^ "Centrals Junior Football Club". Retrieved 11 March 2019. ^ Walker, Terry (1995). Fast Tracks: Australia's Motor Racing Circuits: 1904-1995. Wahroonga, NSW: Turton & Armstrong. p. 176. ISBN 0908031556. .
^ Galpin, Darren. "Wangaratta". GEL Motorsport Information Page. Archived from the original on 9 February 2008. Retrieved 1 April 2016. Wikimedia Commons has media related to Wangaratta, Victoria.